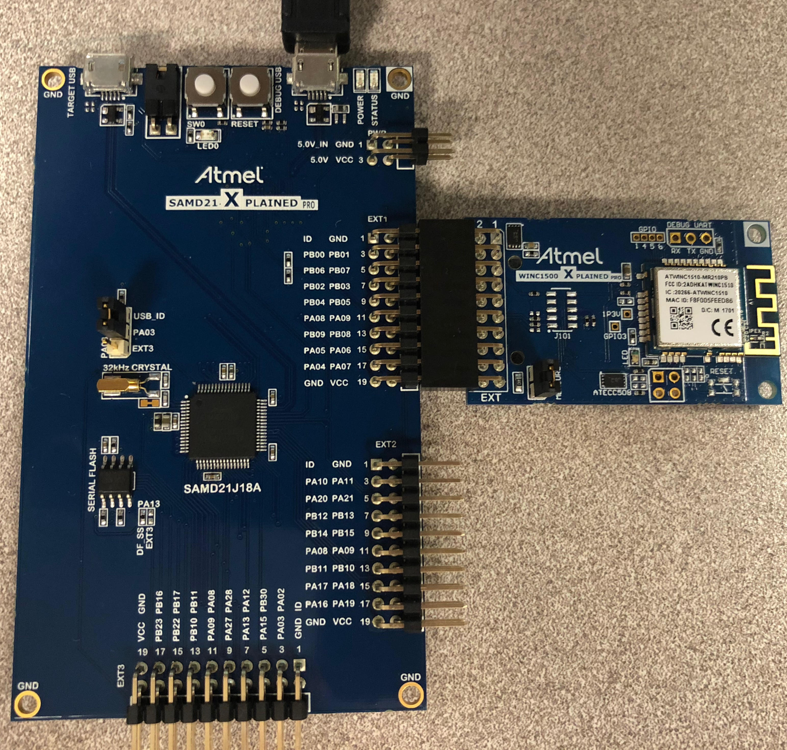 The objective of this lab is to update the WINC1500 module to version 19.5.4 of the firmware using the Firmware Update Project found in Atmel® Studio 7.0. The update procedure requires the WINC module to be attached on EXT1 of the Xplained Pro kit. If you would like step-by-step instructions on how to perform an OTA Firmware Update on the WINC1500, refer to the "OTA Update for WINC1500 Firmware (v.19.5.4)" document. OTA firmware update is supported starting on version 19.3.0. 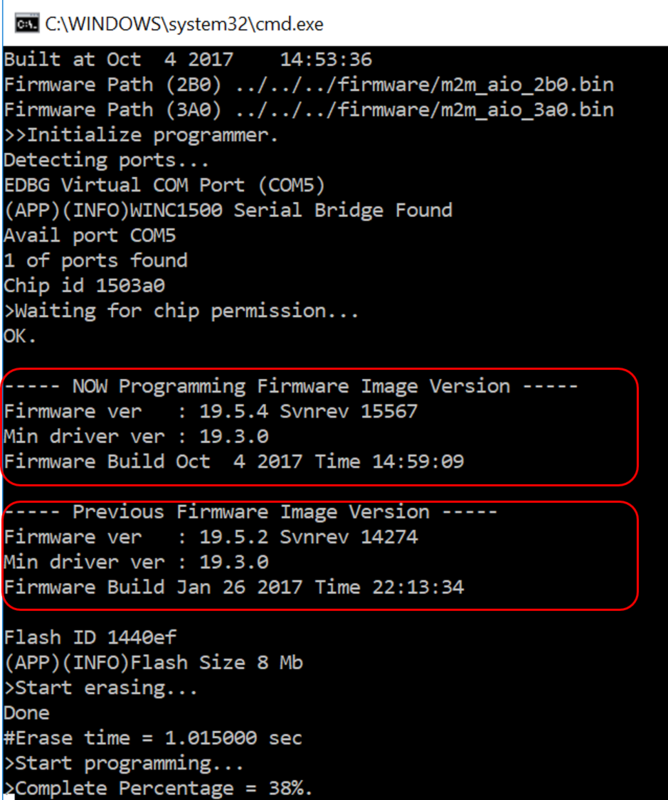 OTA can’t be used to update the ATWINC1500 from version 18.x to 19.x of the firmware. 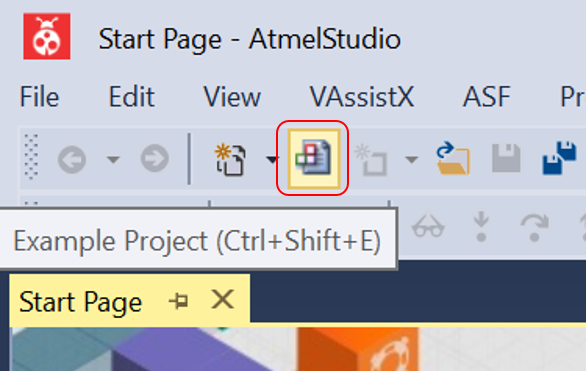 Click on the Example Project icon. 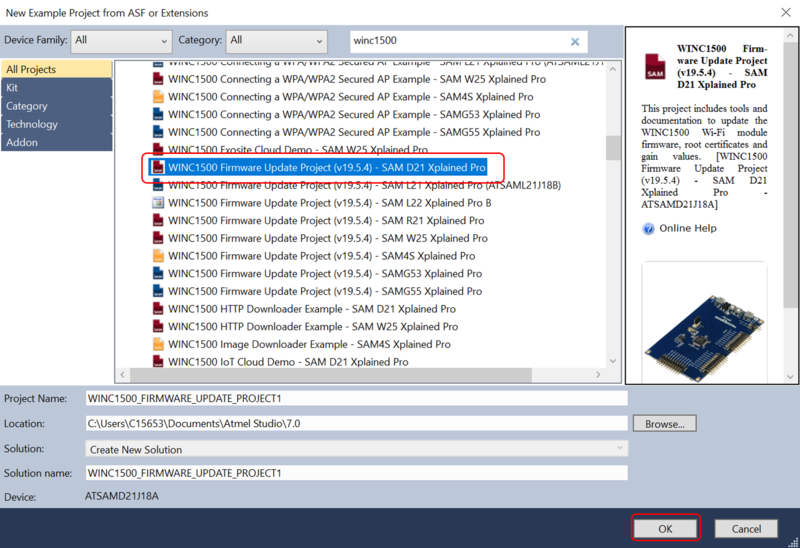 In the search box type in WINC1500 and then expand the example list tree to browse through the example projects. WINC1500 Wi-Fi module related projects are all prefixed with “WINC1500” making it easier to filter the project in the dialog. Scroll down until you see the 'WINC1500 Firmware Update Projects'. In this lab, we are using the SAMD21 Xplained Pro Board which means we have to select the 'WINC1500 Firmware Update Project (v19.5.4) - SAMD21 Xplained Pro' option. The available batch files are located in the following location: \AtmelStudio\7.0\WINC1500_FIRMWARE_UPDATE_PROJECT1\WINC1500_FIRMWARE_UPDATE_PROJECT1\src. Click on samd21_xplained_pro_firmware_update to update the firmware using the SAMD21 Xplained Pro Board. 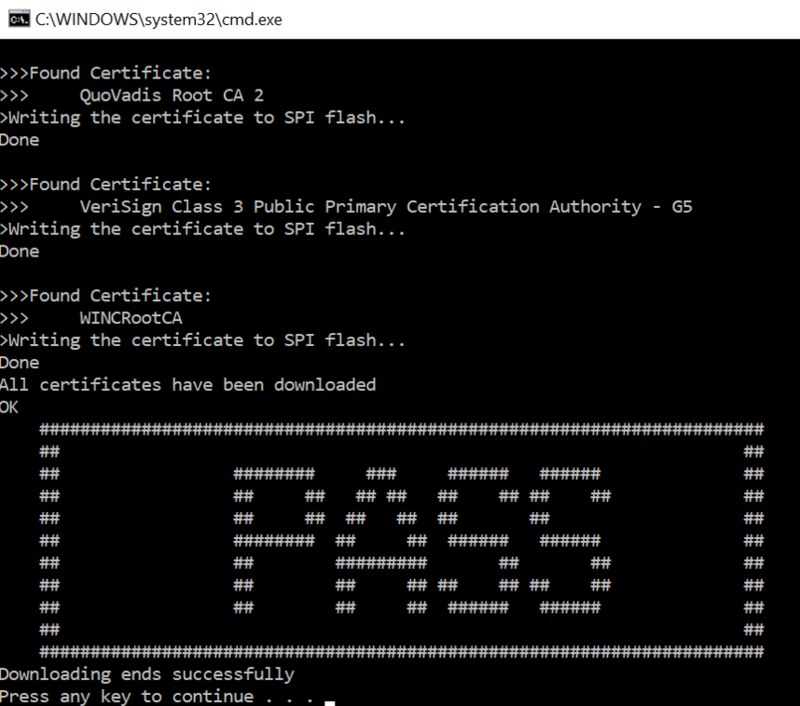 Keep in mind that the batch file to be used will depend on the Host MCU you are using to update firmware. The firmware update will start. The previous firmware version as well as the version now being programmed will be displayed. 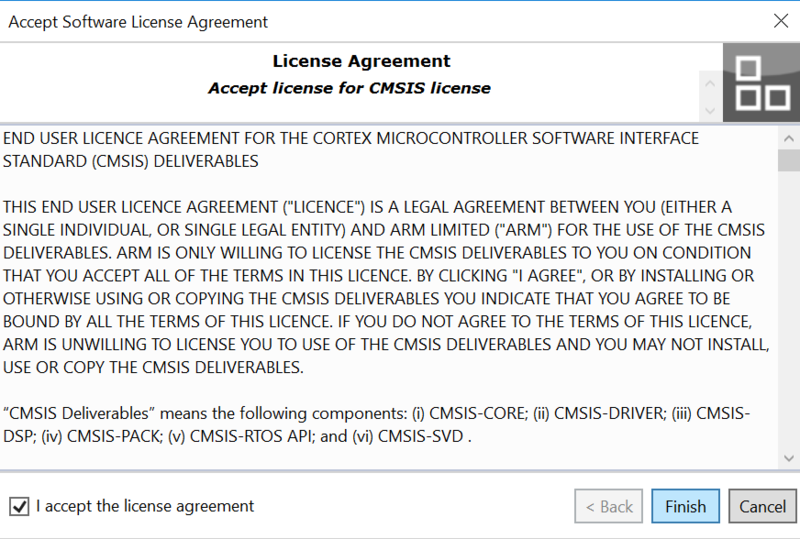 After a few seconds, the following screen shows that the firmware was successfully updated to version 19.5.4.